The home where Dad and his mom lived for two years. One year ago, Dad and I were preparing for the trip of a lifetime. For three years, I’d been on a quest, learning about my ancestors, and how their experiences had shaped me. As part of that soul journey, in 2016, I’d taken a motorcycle trip, dubbed the Ancestor Trail. It traced the migration of both sets of grandparents through western Canada after they landed here as refugees in the 1920s. I’d often call Dad to ask questions about our history. He delighted in unearthing family stories and getting together with his sisters and cousins to help me with my research. Through regular phone calls during my time on the Ancestor Trail, he’d followed every mile while I rode my motorcycle around the country. Beaverlodge, in northern Alberta, and two hand-made wooden valises were his only connection to Johann, his father. Johann had died at age twenty-eight, two years after arriving in Canada, when Dad was only two years old. He was buried in a now-derelict cemetery on land he’d once tried to tame. 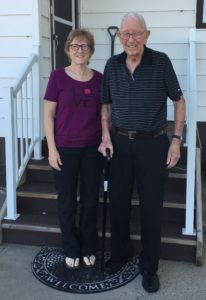 At age 91, Dad walked with a cane, sometimes a walker, but his health issues were stable after falling and fracturing his hip early in 2016. This window of opportunity would unlikely open again. He and Mom, who was in long-term care with dementia, had been back in 2000, but now we had more facts and history. I’d discovered a 1928 probate file Dad hadn’t known about, which specified the exact quarter-sections of land Johann had farmed, and where Dad had lived. This trip would fuel him with stories and memories to last at least through the winter. “How would we go?” he’d asked, pondering the idea when I’d asked if he’d like to go to Beaverlodge. He thought I was thinking of putting him on the back of my motorcycle. I laughed. “We’ll fly and rent cars out there,” I said. “You cover the travel expenses. I’ll look after you.” I’d checked with my siblings to make sure they were comfortable with this arrangement. It would be strenuous for both of us, me more from worry that he’d lose his balance, fall, and injure himself, especially when he was alone in his hotel room. Knowing how fatigue made him more vulnerable, I was afraid to let him out of my sight, but I’d have to, just as he’d had to let me be independent. We began planning where we’d go, and whom he wanted to visit. He asked to extend our time in Alberta by one more day. And so began a journey that can best be described as extraordinary, for both of us. A month after we returned, he became ill and died less than a month later. His life had come full circle as he’d reconnected with his father, and his past. That trip was the greatest legacy he could leave me, and a vital piece of my quest. With great honor, gratitude, and much love, I remember him this Father’s Day. The above is based on a story that’s recounted in detail in my upcoming book, Crash Landing, The Long Way Home. Thanks Gary. I’m looking forward to having it out. Such a beautiful memory for you Liz. Thank you for sharing. I love your writing style – we just get the challenges and love in the situation. Thanks Patti. Gift of a lifetime from him. Liz what you did for yourself and your Dad was life fulfilling for both of you. How wonderful you were able to put this together. I am sure he is still smiling. I think he is, too, Mary. Thank you!